The crowd-funded billboard will travel around the U.S. Capitol and comes on the one year anniversary of the FCC’s repeal of net neutrality protections. 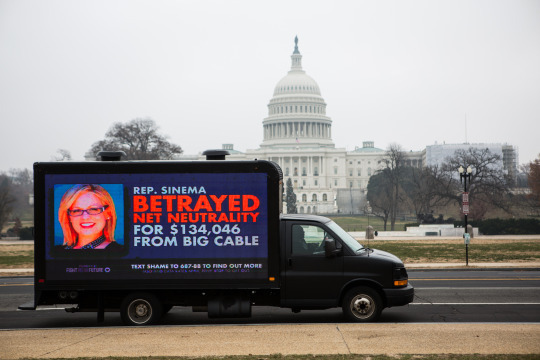 WASHINGTON, D.C—Today, on the one year anniversary of the FCC’s resoundingly unpopular repeal of net neutrality, Fight for the Future has launched a mobile digital billboard which will circle the Capitol grounds for more than 8 hours on Friday exposing the lawmakers who have put the interests of giant telecom companies over those of their constituents by refusing to sign on to the House resolution to restore open Internet protections.. PHOTOS and VIDEO of the billboard can be found here. Watch/Embed the raw full video that will play on the billboard here. The billboard features the individual face of every congress member who has betrayed net neutrality by remaining absent from the CRA discharge petition and the total amount of money they have taken in campaign contributions from big ISPs like Comcast, AT&T, and Verizon. Following each congress member the video billboard will display photos of constituents who signed an open letter to Congress and submitted photos in support of net neutrality. The billboard will also direct users to BattleForTheNet.com where they can see how their lawmakers scores on net neutrality. Lawmakers have until the end of the Congressional session to show that they support real net neutrality protections by signing on to the discharge petition. Three reps have signed on in recent weeks: Joe Morelle (D-NY), Susan Wild (D-PA), and Frederica Wilson (D-FL). Yesterday, Rep Mary Gay Scanlon (D-PA) announced that she will sign on to the discharge petition after she faced massive online backlash for posting a video saying she wasn’t going to. Fight for the Future launched DemsAgainstThe.Net, a campaign shining a spotlight on the handful of remaining House Democrats who have failed to sign the petition, all of whom have taken large contributions from telecom companies, which has generated significant local and national media attention. Earlier this month the Internet users from across the country were joined by companies like Etsy, Pinterest, and Postmates and celebrities like Alyssa Milano and Tom Morello for an Internet-wide day of action. Thousands took to DeadlineForNetNeutrality to sign an open letter to Congress containing a heartfelt plea to overturn the FCC’s repeal. In the year since the FCC repeal, millions people have taken action through BattleForTheNet.com. Tens of thousands of Internet users, 7,000 small business owners, 4,600 US veterans, and thousands of first responders have signed on to open letters. Volunteers have organized hundreds of protests and in-person meetings with lawmakers in support of the CRA and more than 1.9 million phone calls have been made to Congress.